This revitalising mask, with alpine rose stem cells, delivers deep hydration and cellular support to soothe, nourish, and transform sensitive skin. Pomegranate tones and tightens as hyaluronic acid and aloe vera revive skin`s moisture barrier for a naturally flawless complexion. Apply evenly to clean, dry skin. Avoid eye and lip areas. Leave on for 10 minutes. Rinse clean with cool water. Use 1-3 times per week, as needed. Below are reviews of Andalou 1000 Roses Rosewater Mask - 50ml by bodykind customers. If you have tried this product we'd love to hear what you think so please leave a review. I have a lot of leftover redness from spots and honestly wasn't/ am not looking for this to be a miracle worker. I just like it because it feels hydrating and is soothing. Sometimes it's nice to use something nice and refreshing as opposed to an acid or clay mask. I saw Trinny use this and I do like it myself. Good ingredients and doesn't break out my combo/oily skin. 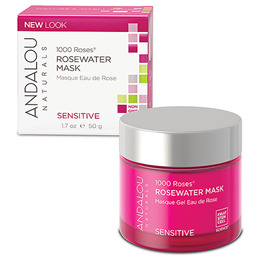 This revitalising mask, with alpine rose stem cells, delivers deep hydration and cellular support to soothe, nourish, and transform sensitive skin. Pomegranate tones and tightens as hyaluronic acid and aloe vera revive skin`s moisture barrier.